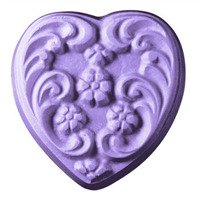 COMMENTS: I don't care too much for the plastic molds, but this makes a beautiful soap! COMMENTS: This mold is so elegant! I love it for my soaps, bubble bars, and bath bombs. Perfect size, too! 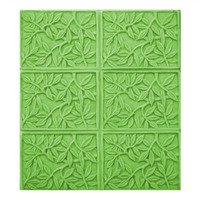 COMMENTS: I love this mold, and so my clients. 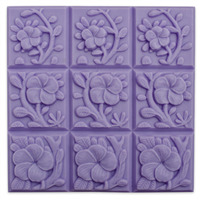 I prefer silicone molds because they are easier to handle with soap, but this one is good and has a beautiful pattern. I recommend it. COMMENTS: I love this mold so much -- sooooooo much! I have too many molds at this point (might need to seek professional help), so I've hardly used it, but I LOVE it. I need more hours in the day -- and more mold storage. 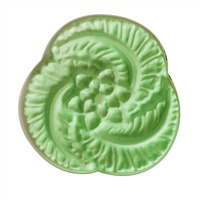 This, like many of Catherine's designs, looks like it was carved from wood, like an old German cookie or butter mold. 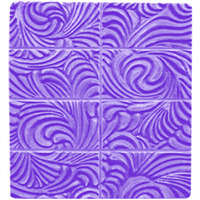 I'd love to see this pattern in a bar mold, with wrap-around sides so that the design is on the sides, too. 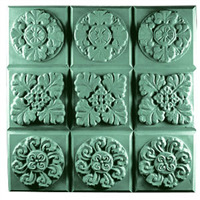 COMMENTS: I hate wallpaper but I like this soap mold. I love the floral design with all of my floral type scents. COMMENTS: This is such a beautiful mold. Love it!